Washington, D.C. -- Yolanda Renee King, the 9-year-old granddaughter of Dr. Martin Luther King Jr., took the stage at the March for Life rally in Washington D.C. She sounded every bit like her illustrious grandfather when he spoke in the same city to a like rally of tens of thousands fifty years earlier. She brought the house down when she implored the crowd to fight for a “gun free world.” The young King’s plea deliberately wrapped in words from Dr. King’s legendary famous 1963 “I Have a Dream” speech, was much more than emotional symbolism. The march and her appearance on the podium came less than 2 weeks before the day, April 4, fifty years ago that her grandfather was gunned down in Memphis. King’s murder sparked a momentary deep national soul search about the carnage of gun violence and the grave peril that wanton violence posed to the nation. But that soul search was fleeting. In the decades after his murder, the NRA grew in wealth, membership, power, and influence. It clamped a near iron-fisted grip on Congress to make sure that even the most tepid, inconsequential gun control measure died a swift death there. Meanwhile, the gun rage soared with more guns in American hands than in the hands of soldiers in World War II. An intransigent gun culture, a movie industry that glorified violence on the big and little screen, a media that turned murder and violence into a ratings cash cow, the resurgence of hate groups, and the fall off the social ledge of unhinged, frustrated young white males, virtually insured that America would plunge into a new and even gorier era of nonstop mass murder and mayhem. The Parkland mass shooting was the tipping point that brought legions of protesters to the streets. It was the same peril of gun violence that not only brought King to the streets. He repeatedly demanded that the civil rights movement make a firm commitment to combatting violence. This was more than political pragmatism on his part. King abhorred violence, all violence. While it’s true that he did for a brief time in the mid-1950’s in Montgomery, keep a gun in his home, it was purely for self-defense. King soon got rid of it and made clear that keeping a gun flew in the face of everything that he believed in and implored others to believe in; namely a total commitment to non-violence. That didn’t stop the NRA, though, from trying to peddle the lie that King would have backed the NRA. This was a crude, crass and cynical effort to invoke the name of the America’s greatest champion of non-violence, to push its anti-any gun control agenda. King’s granddaughter’s appearance and impassioned plea at the March for Life was stark recognition that the ante had been bloodily raised in the fifty years since her grandfather’s murder. Guns were not just killing individuals, they were now weapons of mass destruction and terror in schools, workplaces, at public events, and on the streets. Anyone, anywhere, at any time could be a victim. The lethalness of the weapons and the ease with which practically anyone could get an arsenal of them, had now turned gun violence into a major health issue and challenge for the country. King almost certainly would have been deeply pained by the spectacular and grotesque mass killings in cities from Aurora, Colorado and Newtown, Connecticut to Las Vegas, and of course, Parkland. That wouldn’t have been all. His deep concern over gun violence would also extend to the murder plague in Chicago, Baltimore and other cities. He would almost certainly have joined in the intense lobbying campaign to get Congress to pass comprehensive gun control legislation. He would bring much experience to the gun control campaign on how to use non-violent tactics as a weapon to appeal to the conscience of fence sitting Congresspersons, and even opponents, to enact meaningful gun control legislation. Then President Obama may well have reached out to King and enlisted his support in the efforts he made to prod Congress to pass tougher gun control regulations. When Obama eventually signed a handful of executive orders that pecked at the edge of gun control in 2013, King might have been invited to witness the signing. His presence would symbolize the importance of a renewed movement to combat murder violence in America. On this issue, King would have had the overwhelming support for any actions he took on ending gun violence from millions of Americans. Polls show that most Americans have consistently supported stronger gun control bans. 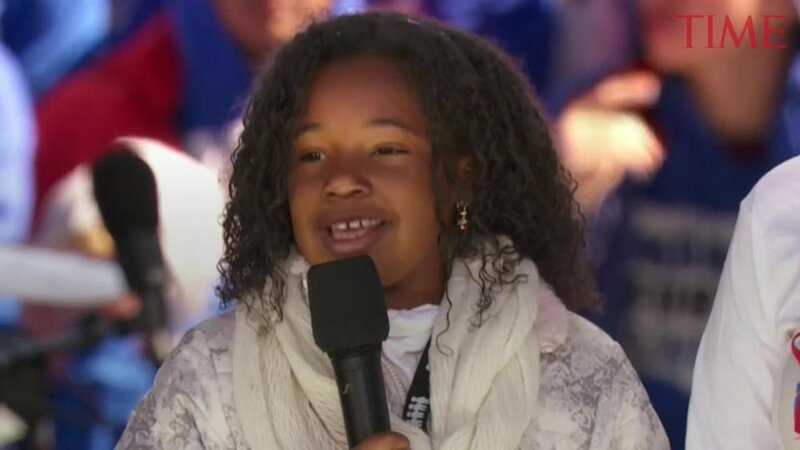 Yolanda Renee King, the 9-year-old granddaughter of Dr. Martin Luther King Jr.